STURGIS is STURGIS — Since 1938 the Sturgis Rally has been held every year, with some exceptions during WWII, for example the gasoline rationing in 1942. And as a result, a lot about Sturgis remains nearly the same year after year after year. There are the RVs, tents, vendors, concerts, people watching and lots of motorcycles. And did I already say there is a lot of people? Every year they try to make it bigger, better and fancier. In fact, this year the musical lineup included folk icon Dylan to heavy metal pioneer Osbourne along with some Motley Crue and ZZ Top in-between. Each of the big three camp grounds compete with each other to see who can bring in the more impressive talent. But there feels like a bit of a metamorphosis at Sturgis. It’s become noticeably more commercial. 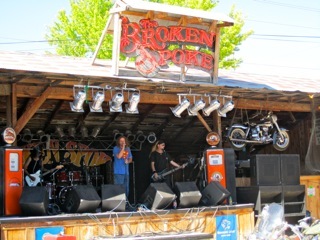 Even the Hells Angels had a booth serving up (for a fee) a Sonny B. book signing along with calendar and t-shirt sales! The rally has turned a corner toward a concentration of commercialized chrome with a sanitized or reserved atmosphere. Nothing wrong with that. It’s just about moneymaking which doesn’t interest a lot of folks. Our group persevered through the changes in rally persona, and spent a couple days at the “humble rumble” (i.e. 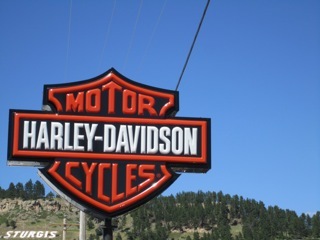 Sturgis) – enjoying all that the town and surrounding area had to offer up – I departed with only one t-shirt! The Sturgis population of 6500 hosts a few hundred thousand biking enthusiasts and along the way the economic engine collects about $987M in state tourism for the little celebration. Capitalism at its finest! 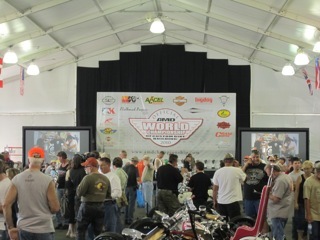 And if you don’t think there are many people in attendance… consider this: NYC has 26,402 people per square mile; Sturgis during rally week has 160,427 people per square mile! 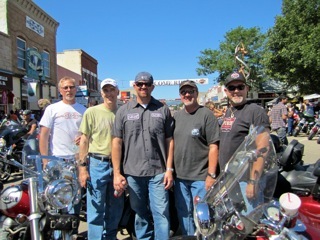 In my estimation there are 3-types of people who come to the Sturgis rally. The CASUAL OBSERVER – who may ride, but most likely does not and spends most of the day in t-shirt shops buying “proof” they were at the ‘mayhem’ or event. Next is the RECREATIONAL RIDER – some who rode there, but many likely trailered their $35K CVOs. This group offers up the largest opportunity for the vendor booths as the biker subculture fantasy doesn’t come cheap. The last group is the RODE MINE whose leather jackets patina match the sunburned faces. You don’t get that bright red tan while sitt’n in captain seats in the Ford F-series pickup! There might even be another group, those who don’t own rain gear, sport offensive tat’s and do tune ups along the way. They have a true pulse of the V-Twin and a real sense of brotherhood. But I’ve digressed. For most the celebration will come to an end and will need to shave and shower and squeeze back into the cubicle. In other words, get back to work as were going to need to pay off the August credit card bill! 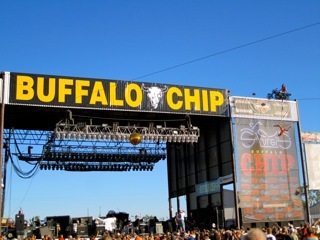 From my vantage a few highlights were: the Kid Rock concert at the “Chip” (Dylan was totally lame! ); face-to-face with Harley executives (Willie G., Bill and Nancy); Mount Rushmore achieved the highest single day attendance record on August 10th; witnessing the ear blasting B1-B Bomber fly over on main street; “The Wall That Heals” (a ½ scale replica of the Vietnam Veterans Memorial); the AMD World Championship customs; free Macanudo cigars and the Harley-Davidson booth/crew. Speaking of the H-D booth, I want to provide a shout out to the Milwaukee team for a job well done! In previous years you’d have to commute to Rapid City to see the new model line-up which many riders passed over. It was extraordinarily convenient to meander up from the Broken Spoke and talk up new features with the well trained H-D personnel who were genuinely interested in chatting it up with riders. Now for some of the bad news: the 70th Rally saw about double the number of road deaths/crashes vs. previous year averages. Nine people were killed in the Sturgis area during the rally. There were no deaths last year. This number doesn’t account for fatal wrecks in other states involving motorcyclists on their way as was the situation for an Oregon man who crashed on US 12 near Powell, ID HERE. Granted the higher number of attendees does contribute to potential crashes, but in many instances the accidents seemed due to inattention. Early stats indicate that fewer people were arrested for drunken driving, but more for drug violation. Law enforcement responded to 73 injury accidents and 36 non-injury which was similar to previous years. Total citations for the 2010 rally were down to 1442 vs. 1803 in 2009. 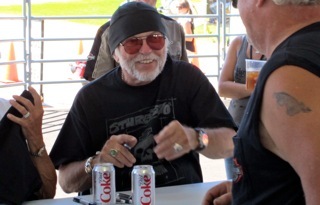 70th Sturgis Rally Travelogue – Part 1 HERE and Part 3 HERE. Photos taken during the trip.